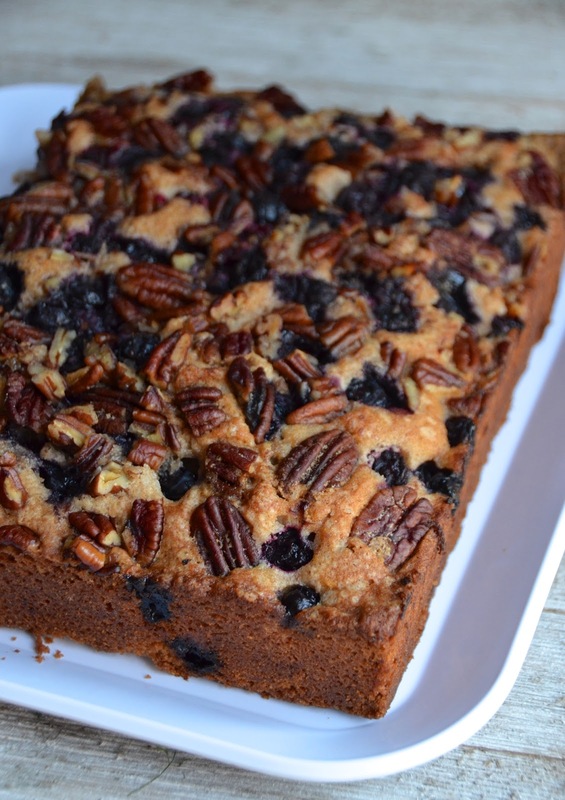 I bake a lot of cakes, but this Cinnamon Blueberry Pecan Coffee Cake is one of the best things I've ever made. It's ridiculously simple, but there's something about the combination of the fresh summery blueberries, nutty pecans, and warm cinnamon that makes it particularly satisfying during these in-between weeks. It's not quite Fall yet, but you can feel summer drifting away. There are still some crazy hot days ahead, but the attitude has changed. This cake seems to fit the occasion. A slice would be lovely with a warm mug or something on a chilly afternoon. But it would also work perfectly eaten out of hand in the waning summer sun. Or bake it up and bring to a friend to share. I made this one with fresh blueberries, and definitely do the same if you can get them, but I think frozen ones would work, too. 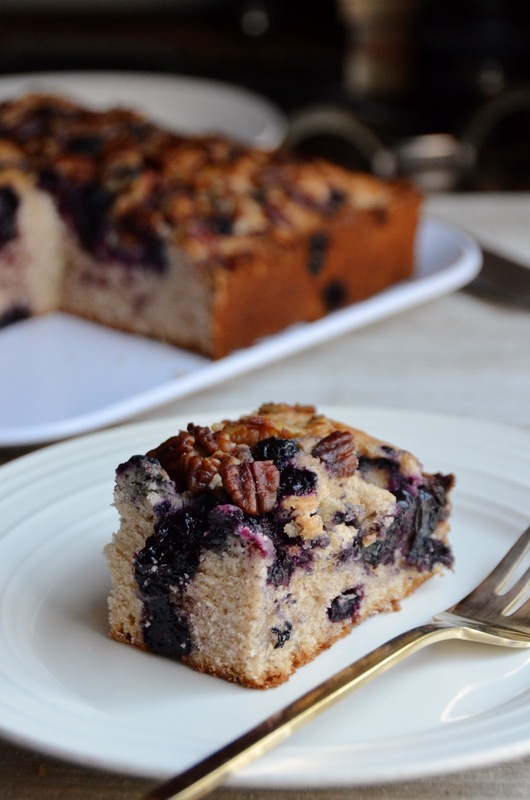 I love tiny frozen wild Maine blueberries (it's what I used in this other favorite cake) and think those would be really lovely here. 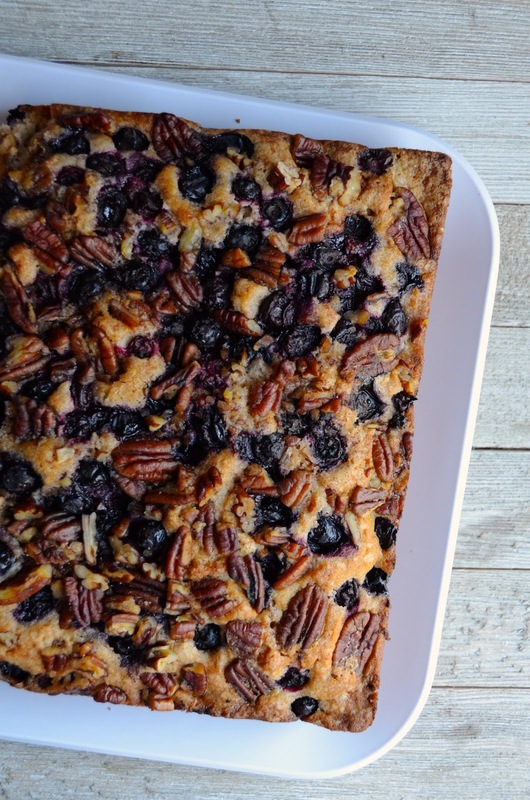 This cake takes just about an hour to make from start to finish, and will keep well for days. We've had ours hanging out on a table in the living room loosely covered with some plastic wrap. Eugene takes a slice to work with him each morning. I pick at it throughout the afternoon as I work from home. I'd love to hear what you think of it! In a small bowl, whisk together flour, baking powder, cinnamon, and salt. Pour into liquid ingredients and mix just until evenly combined. Stir in about 1/4 of the blueberries (just a handful of them). Then pour the mixture into the prepared cake pan and spread evenly. Sprinkle with the raw sugar, then top with the blueberries and pecans, spreading evenly and pressing slightly into the batter. Pour the melted butter over the top and sprinkle with a bit more cinnamon.